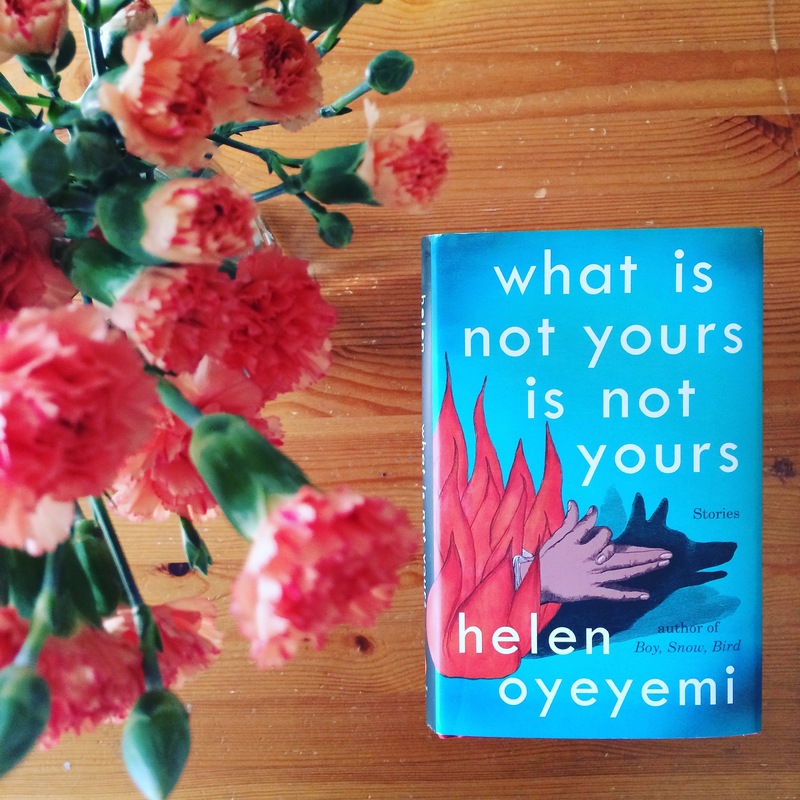 A couple of years ago, I had the pleasure of reading Helen Oyeyemi’s work for the first time (review of Boy, Snow, Bird here; interview with Ms. Oyeyemi here), and I’m delighted to report that What Is Not Yours Is Not Yours*, a collection of stories, is just as intriguing. These nine stories (with titles like “Is Your Blood As Red As This?” and “Presence” and “Dornička and the St. Martin’s Day Goose”) are billed as linked. And they are linked thematically, through a key and lock motif, and through their focus on characters’ secrets. However, as I read the first half of the book, I think I spent a bit too much time searching for connections between each story (primarily character and location); by the time I sat down to read the second half, I’d relaxed into the book’s thematic concerns. On the short story collection-connectedness spectrum (which I just made up), it’s closer to Rebecca Makkai’s Music for Wartime than, say, The Tsar of Love and Techno (Anthony Marra). I loved these stories’ elegant strangeness, the feeling they gave me that I was not on firm ground, but instead racing to suss out the boundaries—or lack of boundaries—in Ms. Oyeyemi’s worlds. In stories like the aforementioned “Dornička and the St. Martin’s Day Goose” and “Drownings,” readers are set down in the world of a fable or fairytale, though closer to their grim origins than the sanitized cartoon versions of childhood. In “‘Sorry’ Doesn’t Sweeten Her Tea,” a teenage girl, incensed with her favorite pop star’s non-apology to a woman he’s beaten, enlists the help of a friend of her stepfather’s—and the goddess Hecate—to bring him to justice (the story is, among other things, a brilliant exploration of online and real-life bullying). There’s a story about puppets, including one so real that s/he is mistaken for human; a story of a secret garden and the abandoned but not unloved women who might hold its key; a story of a land ruled by a tyrant whose drowned victims live in an underwater city; a story in which an unlikely sorority (The Homely Wench Society) conducts a raid on a rival fraternity in which they swap books (this last story is so charmingly, queerly British that I found myself grinning from ear to ear at the end). There’s a hotel (where “the furnishings are a mixture of dark reds and deep purples. Moving through the lobby is like crushing grapes and plums and being bathed in the resultant wine”) whose guests, once checked in, can never leave (though they can ask almost anything of the management). There’s a pair of therapists who choose themselves as test subjects for an experiment that shows them what might have happened in their lives. This NPR profile (from 2014, when Boy, Snow, Bird was published) is wonderful, and I think does a better job than I am doing right now of conveying the “jolly gruesomeness” of Ms. Oyeyemi’s writing. In it, she talks about finding something about Eastern Europe that meshes with her outlook, and you can see in this collection that her travels in that part of the world have born fantastical fruit. She sketched with an effort that strained every limb. Montse saw that the Señora sometimes grew short of breath though she’d hardly stirred. A consequence of snatching images out of the air—the air took something back. One imagines that Ms. Oyeyemi is often breathless. What Is Not Yours Is Not Yours is highly recommended, and available in the US today. I love the title of this one. I’m glad, though, that you explained the connectedness of the stories. Otherwise I would have imagined another Olive Kitteridge and might have been disappointed. It took me two or three stories before I realized I shouldn’t expect that–glad to be of help! I have been on the lookout for this one after reading Boy, Snow, Bird. Oh I just crazy love Helen Oyeyemi. Although I’d rather she have written another novel (because I’m greedy that way), I thought these short stories were excellent. I very much liked the one about the therapists trying out the experiment — that one and “Sorry Won’t Sweeten Her Tea” were maybe my two favorites, although I admit to being swayed by the title of the latter. Thank you! They’re a sort of coral color, and they’ve lasted a long time. So looking forward to this collection. I haven’t read anything by her but am a huge fans of short stories! Then this is a great place to start! It showcases her style really well. 🙂 Thank you for reading! This really sounds wonderful. I have not yet read Oyeyemi and now here is one more reason to get to it! She’s fantastic! I’m itching to read Mr. Fox next.